Needing an addition to my carry arsenal, and not wanting to spend an arm and leg the Taurus Millennium Pro PT140 .40 S&W appeared to be my answer. So, off I went to Academy Sports to see what they had available. There in the case sat a Taurus PT140 Pro and a PT111 Pro in .9mm. I settled on the PT140 with 10 round mags, and purchased the new gun for a paltry $319.95 + tax. The gun was black and sported a set of windage adjustable Heine Straight Eight sights. I took the gun home, cleaned it, and took it out to the Old Fort Gun Club. I stapled up some full size silhouette targets and loaded up. I started out shooting with heavy gloves on and it was evident right away the gloves would have to go. I was shooting a foot low from 30 feet. Off came the gloves and up came the shots. 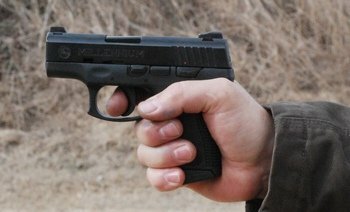 The Taurus Millennium PRO is too small for shooting with warm gloves on my average size hands. A slight right adjustment on the drift-adjustable Heine sights and I was on target. And the more I shot, the better it got. After abound a hundred rounds, I was having too much fun to stop. I emptied a half box of around 400 reloaded bullets, and finally just had to stop to go home. Since then, I've put another 150 rounds of Speer Lawman 180 grain flat points through the Taurus PT140 Pro. The Taurus Millennium PRO PT140 fits my average size hands pretty nicely though I think a little bulk in the form of a slip-on Hogue grip might help it a bit. 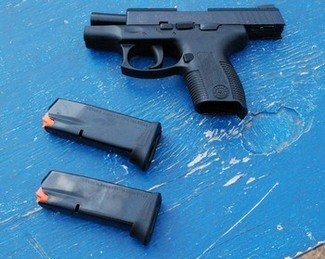 The gun points naturally and comes on target easily with a little practice. It lends itself well to either sight or point shooting according to distance and speed of shooting. 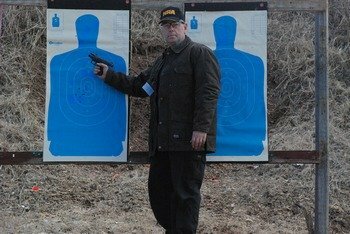 For my initial range time, I was able to put all 10 rounds of the pistol in the head or center mass of a silhouette target with relatively fast firing, from out to about 40 feet. The Taurus Millennium PRO makes for a dependable, reasonably accurate, easily carried pistol that holds 10 rounds of ammo (for the .40, 12 for the .9mm), sufficient for most any civilian emergency encounter. The difference in price between it and a similar size GLOCK is $250 less for the Taurus Millennium Pro. It shouldn't take too much brain power to figure the best deal. And please don't write to tell me the GLOCK will perform better. Remember, I'm a GLOCK lover. But I also try to be responsible with how I spend my money and I have pretty extensive experience with Taurus handguns. The TMP was the way to go for this small carry pistol. 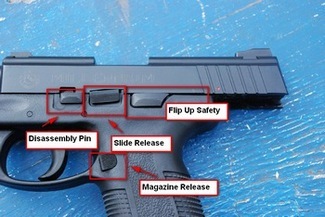 Add to all that, the flip up external safety, allowing me to more safely handle the gun when it has to be removed to go in someplace where carry is not legal, and it seals the deal. 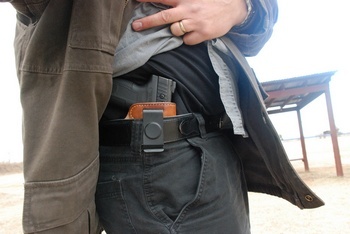 These guns can have a significant place in the world of concealed carry. This Taurus Millennium Pro performed as most Taurus handguns that I have owned, flawlessly. At this point, it takes a lot of ignorance to issue blanket criticism of Taurus firearms. Taurus has not only proven that it can put it's guns up against any combat handguns, they have also led the way in innovation in features like the "second shot" capability with their striker fired pistols. Sure it's possible for Taurus to have quality control issues or bugs in newly manufactured guns, but it's also possible for S&W, Beretta, Sig Sauer, H&K, and others. The difference is, that when Taurus has a gun with bugs, people throw a blanket of sarcasm over the whole company instead of just the gun in question. Bad move. "Don't throw out the baby with the bathwater" applies here. I read a frantic complaint on a firearms forum recently about a Taurus Millennium Pro that he purchased and "straight out of the box" he had problems with it. I wonder why..........actually I don't. I know why. Here is how they come packed "in the box". No gun will perform with that amount of grease gumming up the action. Before you go to the range with any gun, take a deep breath, go home, take it out of the box and clean and lightly oil it before taking it to the range. That will solve most "out of the box problems". Anyway, mine is great and on the road to being consistent performers like all the Tauruses I've owned. The Taurus Millennium Pro is now listed on the Taurus web site as Model 140BP. Lettering on the side is different than the one I tested. Same gun. Here are the stats: Caliber: .40 S&W, Capacity: 10+1, Barrel Length: 3.25", Action: DA/SA, Finish: Blue Steel, Grips: Checkered Polymer, Weight: 18.7 oz, Construction: Polymer/Steel, Frame: Compact, Front Sight: Heinie, Rear Sight: Straight-8, Trigger Type: Smooth, Length: 6-1/8", Width: 1.125", Height: 5.125", Rate of Twist: 1:16", Grooves: 6, Safety: Firing Pin Block, Manual Safety, Trigger Block. BOTTOM LINE: People who want to bash these guns without sufficient experience with them to do so, are showing ignorance that I wouldn't want thrown around. Over the last four years I have owned seven Taurus handguns, including this one, all but one, flawless performers. Dependable, durable, accurate and innovative. It's time to give credit where credit is due to a firearms manufacturer that is producing quality guns on the cutting edge of innovation in the handgun industry.